Language exists for the purpose of communication. We have rules of spelling, punctuation, and grammar for the sake of clarity and uniformity. In the absence of such rules, ambiguity reigns supreme. I feel that these rules are particularly important in text-only conversations; such scenarios lack any body language or facial expression to assist in comprehension. Yet it is in our increasingly text-based society that the rules are being tossed aside in favour of abbreviations and headache-inducing ideas of ‘cool’. I don’t pretend to be an expert. I’ve never formally studied English grammar. But as I hope you can tell, I’ve got a pretty good grasp of the fundamentals, and if I’m unsure of something I do like to check or ask somebody. I don’t mind expending some effort to ensure that my reader receives the message that I intended to send; I think it’s worth it. I think you’re worth it. This entry was posted in Badd Inglish and tagged punctuation. 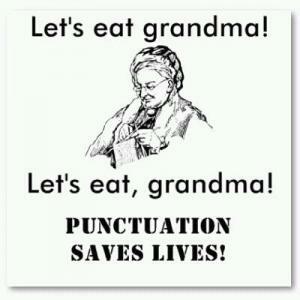 Oh, god, don’t get me started on punctuation. Personally that FB comment doesn’t bother me, it’s just how we speak on there, but abuse of the apostrophe drives me bananas! A noble thought and effort. I admire it. But LOL, it’s my experience that kids don’t give a crap. They want to communicate like they talk; they function with their thumbs on little machines I can barely see and are WAY too preoccupied with looking at them for emails and message. It is like they are on Cloud 9 when they are reading texts. I don’t know how men bigger than the average height do it (send texts themselves). I think the war against bad grammar is lost. It is another lost art in our switch to computerization. We have lost in the name of technology. I think, Stace, that punctuation and the English language (And I’m sure other languages) have been left out in the cold for the ease of expression that is a code thing for just being lazy. Generations, including mine and yours, managed to survive without taking such shortcuts; why would we suddenly approve of them now? Farcebook or computers are NOT necessarily comprised of our best writing and people can argue “it’s just Facebook.” You write the way you write. I don’t think you’ll arbitrarily decide to write poorly gramatically for FB but like a language scholar everywhere else. I think a case could be made that the chance yo WILL write poorly will increase, but don’t know, I’m not a grammarian or a pschologist. That’s just me, the grammar police. I HATE bad grammar on Facebook. I’m definitely not perfect, myself but I do try my hardest to AT LEAST MAKE SENSE! There’s nothing worse than seeing a text message or facebook comment that just runs on and on with NO punctuation at all! Don’t get me started on people who use apostrophes for plural words. Every generation impacts on the language of the previous generation. It has been happening since the days of Ugg. This particular generation with SMS, Tweets and various other technology based communication are going to leave a significant mark, but it too will be taken over and adapted by the next generation. That’s why we don’t all talk like they did in days of old.